Modern office interiors demand flexibility and mobility—an environment that caters to the fast pace of innovation and exchange of ideas. Today’s workforce requires modern office furniture that can adapt to their needs, such as collaborative office furniture that facilitates impromptu meetings and modular workstations configured for the latest technology. As modern offices continue to evolve and adapt their workplaces to changing technology, modern office furniture reflects the newest priorities—alternate work styles, company culture, and progress. Modern Office Furniture Trend #1: Open Office Spaces. Bringing people together in open, comfortable spaces is the forefront of modern office furniture design today. Modular office furniture allows easy customization of your space to suit various project needs and collaborative work styles. To further maximize open spaces in the office, gone are the days of high paneled cubicles. In their wake, lower workstation designs have stepped in to better facilitate collaboration, teamwork, better airflow, and natural light. Whereas storage bins of the past were mounted to 6-foot high panel walls, they are now cleverly placed under worksurfaces or mounted to low beams.All the functionality remains, while achieving a more open feel throughout the office space. Modern Office Furniture Trend #2: Collaborative Furniture. Alternative office design is all about creating an environment that encourages employees to work smarter. 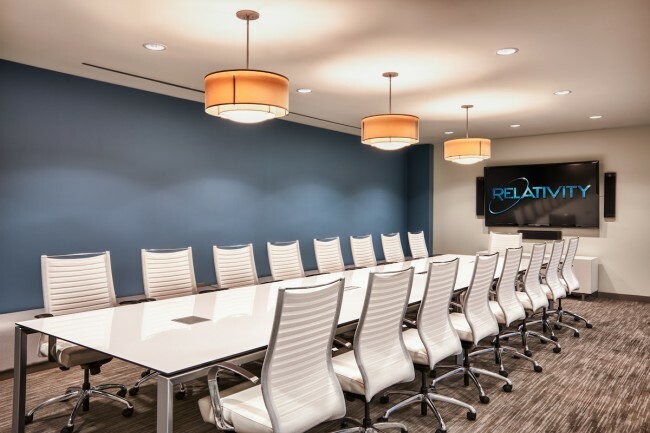 Modern collaborative office furniture is the ticket for companies whose progressive mindset keeps them innovating new ideas to work and communicate. That’s why open-air furniture designs are reinventing modern offices everywhere. Collaborative office furniture creates a relaxed, open-air atmosphere—the perfect environment for informal meetings and impromptu brainstorming sessions. 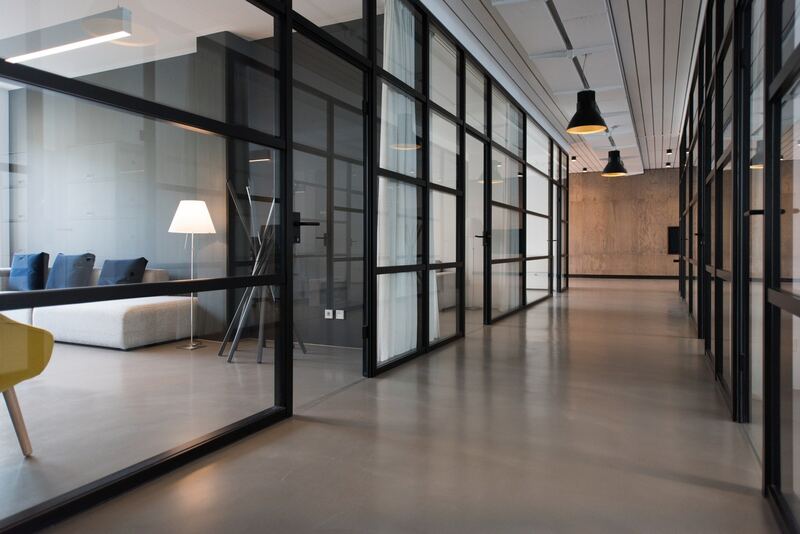 Modern Office Furniture Trend #3: Modern Metal & Glass Design Furniture.The use of metal and glass furniture elements—from modern conference furniture to reception desks—is another hot trend sweeping offices. Modern conference tables with their glass-topped elegance lend your office interiors the stylish, progressive air that will come to define your company. Modern Office Furniture Trend #4: Setting the Mood. Modern office furniture that sets the mood and projects the company’s culture is what corporate interior design is all about—open spaces, colorful designs, and invoking a sense of inclusiveness. Many companies turn to modern workstations to inspire collaboration and encourage teamwork. Modern workstations mean the difference between feeling as though one works in an office versus working as part of a larger team—the company. Modern Office Furniture Trend #5: High Contrast. 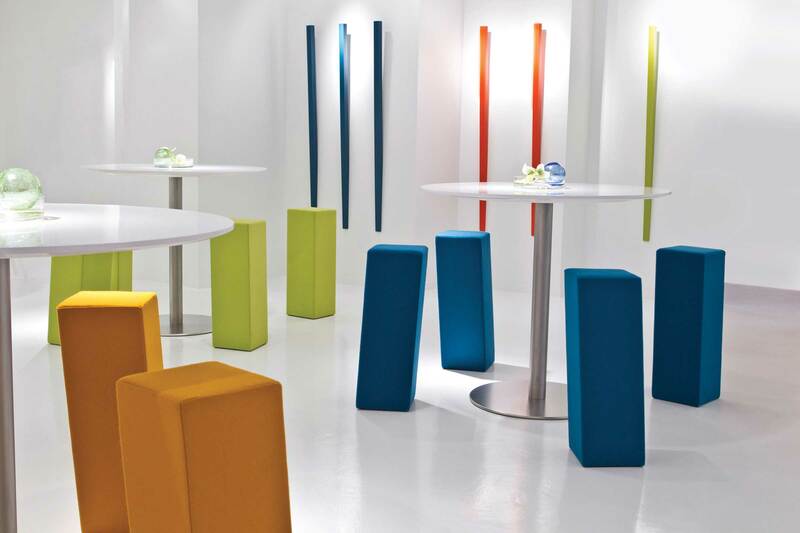 In the modern office furniture world, color is king. Eclectic color schemes and high contrast materials take center stage, exemplifying the growing diversity and innovation of the company. Walk into a private office in Silicon Valley today, and you’ll see executive desks and bookshelves stun in white, wood tones, and metal trim. In conference rooms across the globe, white glass desktops pop against darker wood accents and chrome, or aluminum legs and frames. In open office environments, modular office furniture incorporates white work surfaces with flashes of color—privacy screens boasting lime green, tangerine, or yellow. With these design elements, touches of wood tones give storage door facings visual interest, and the warm organic tones create a balanced modern office furniture design.